Alana Walker strikes the ball. The sophomore middle hitter had 10 kills Sunday. 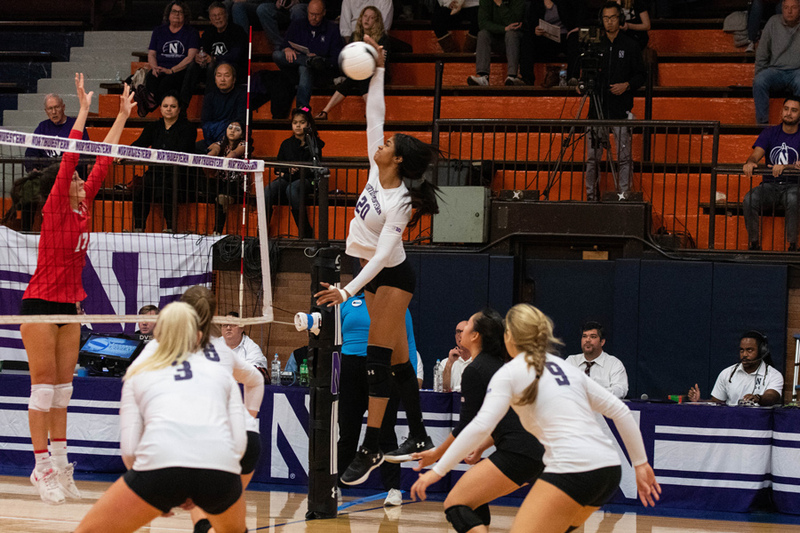 Northwestern dominated in a three-set victory over Ohio State on Sunday in its final game at Evanston Township High School’s Beardsley Gym. The Wildcats handed the Buckeyes their fourth straight loss Sunday. Following its five-set thriller over Iowa on Wednesday, NU (13-11, 3-9 Big Ten) is on its first Big Ten win streak of the season after Sunday’s sweep over Ohio State (12-12, 3-9 Big Ten). NU held the Buckeyes to a mere .136 attack percentage, forcing 18 attacking errors and blocking six kills in a solid defensive effort. Coach Shane Davis said the Cats successfully executed their gameplan in the win. In addition, NU utilized a very balanced offensive showing in the win. Highlighted by sophomore middle hitter Alana Walker, five different Cats had at least five kills throughout the match. It was Walker who came away as the standout performer for NU, though. Walker had an efficient 10 kills on 14 total attempts, including several clutch kills in both the second and third sets, and a victory-securing block over Ohio State’s Vanja Bukilić. After jumping on early leads and cruising to dominant wins in the first two sets, the Cats and Buckeyes exchanged points back and forth throughout much of the third set. After eight ties and three lead changes, NU found itself tied with Ohio State at 19 before pulling away and winning seven of the final eight points to close out the match. The Cats delivered in their last game at Evanston Township High School’s Beardsley Gym, which played host to NU since last season, as Welsh-Ryan Arena underwent a $110 million renovation. The new Welsh-Ryan Arena is set to open this week, and host the remaining four home matches for the Cats. As excited as the team is to move into Welsh-Ryan, Walker and freshman outside hitter Ella Grbac both said they will cherish the memories the team made at Beardsley Gym over the last year. The Cats will look to use the momentum of their last two victories as they continue to improve in conference play. NU’s next game comes at Maryland on Nov. 2, before heading to Columbus to once again battle Ohio State.